EvaluSys® offers a broad collection of online tools helping companies identify and address weaknesses in management practices preventing them from realizing their full potential. Commonly employed by management consultants, business advisors & coaches with their clients, EvaluSys accelerates discovery of value drivers and organizes actions to achieve growth goals. Reveal important process gaps in sales, marketing, finance, H/R and more, limiting business performance and growth. Use individual modules within the Business Wellness Diagnostic Series™ for targeted examination or the entire series for a holistic picture of business management capability and process maturity. Identify key building blocks of business value, define their value contributions and prioritize growth investment. Use business evaluations to kick-start identifying value drivers. Organize collaboration of experts to define specific growth actions and project how each action will build enterprise value. Standard business evaluations address general management best practices. Design and deploy your own unique evaluations reflecting special industries or advisory solutions. Monetize your intellectual capital by collecting fees for evaluation usage. 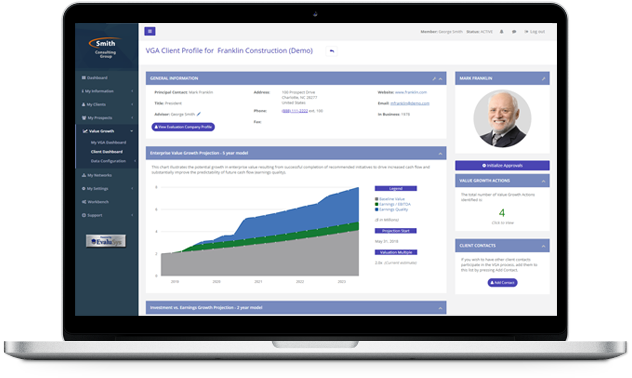 EvaluSys Version 5 brings a graphic-rich, mobile friendly user interface, custom branding for business advisors, and Value Growth Architecture™ for Business Exit Planners and others seeking a disciplined process for building client company value. 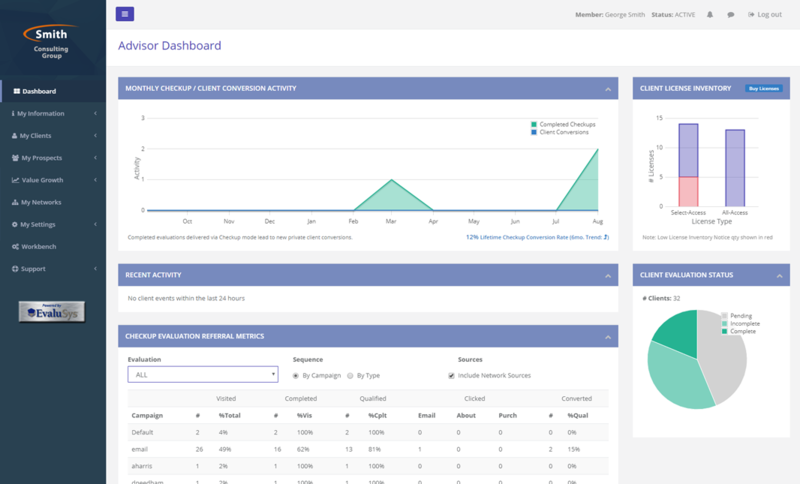 Easy-to-use, member-branded graphical interface for business advisors and clients. Value Growth Architecture offers a disciplined and efficient process to achieve enterprise value growth.